Laure Genillard are pleased to present an exhibition by Peter Downsbrough (1940, New Brunswick, N.J. USA), who has been based in Belgium since 1989 and present in New York’s Conceptual art period of the late 60’s, having studied architecture and art. His material deals primarily with space, as in its volume and height. ‘The underlying structure of spaces and the manner in which they are perceived and moved through, are some issues that Downsbrough’s work explores recurrently and meticulously’, Anna Manubens. 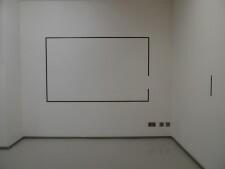 Using uncomplicated means, a few marked black lines on the walls with adhesive tape or verticals lines suspended from the ceiling by way of aluminium tubes (Pipes) plus the use of words, barely decipherable because of having been sliced in half, the work brings a precise separation in the viewer’s reading of the space and how it is perceived. Language being an important component of the work, it enters with a cryptic presence, a few words here and there, positioned on the vertical lines, like an underscore. Words are site specifically pertinent, often chosen from prepositions and prefixes (such as OR, AROUND, FOR, AS, IF etc.). 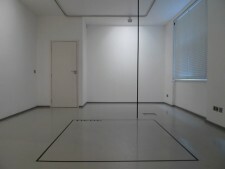 Through an on-going investigation of language and constructed space, Peter stays true to simple principles of Conceptual and Minimal art, using one (or two) materials, in this case metal tubes and adhesive tape and with very little in fact, he makes the viewer somehow more conscious of his own presence in the room thus solving any questions the work proposes. Peter Downsbrough has exhibited widely in Europe and America since the 70’s, in the UK at Jack Wendler’s gallery in 1973 and last November at Chelsea Space. Selected recent museums exhibitions include ‘The Fifth Column’, curated by Moritz Kung at Secession in Vienna, 2011,’In Other Words’, Lewis Glucksman Gallery, University College, Cork (IR), 2011, Platform3, Munich, 2011, ‘Construction in process. ‘The Community that came?’, Museum Sztuki, Lodz, Poland, 2011,‘‘Some Cities’’and ‘’Modèles 2’’, Mamco, Geneva, 2010.